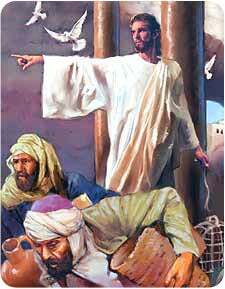 Jesus was visibly grieved as He entered the temple courtyard and surveyed the turmoil. On every hand He saw pens filled with sacrifice animals and heard salesman shouting and bargaining with visiting pilgrims for the highest price. The cooing of doves, bleating of sheep, and lowing of oxen mingled together with the odors of a barnyard to form a concert of chaos. This bedlam was never God's plan. 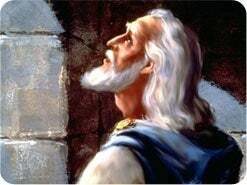 When Solomon built the first temple in Jerusalem, there was such respect for God's house that not even the sound of a hammer could be heard during its construction. All the stones and boards were pre-cut elsewhere, then brought to the temple site and quietly assembled (1 Kings 6:7). Jesus found a handful of cords used for restraining the sheep and tied them into a small whip. Then the Son of God called out in trumpet-like tones: "Take these things hence make not my Father's house an house of merchandise." John 2:16. "It is written, My house shall be called the house of prayer but ye have made it a den of thieves." Matthew 21:13. Moving from one booth to another, He then released the animals and overturned the moneychangers' tables. Sensing they were in the presence of Omnipotence, the terrified merchants fled from the temple courtyard without looking back. Jesus wanted more than anything for people to have a clear concept of His heavenly Father's love and purity. This is why it broke His heart to see the holy temple turned into a flea market. Many years earlier, the prophet Daniel had foretold of another time when the temple would be defiled, God's truth would be distorted, and His people oppressed. And once again, the Lord would come to cleanse His sanctuary. 1. Daniel had an amazing vision in which he saw a ram with two horns (Daniel 8:1-4). 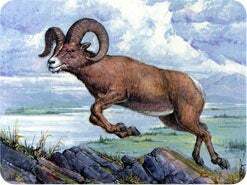 Whom does this ram represent? Daniel 8:20. 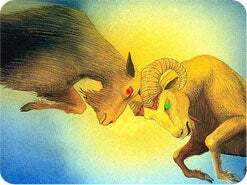 The ram which thou sawest having two horns are the kings of ______ and Persia. 2. Next Daniel saw a goat with a great horn between his eyes. What does this mean? Daniel 8:21, 22. 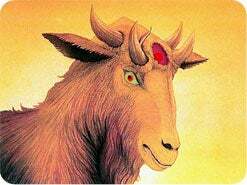 The rough goat is the king of ________: and the great horn that is between his eyes is the first king. Now that being broken, whereas four stood up for it, four kingdoms shall stand up out of the nation. NOTE: The male goat represents Greece and the big horn is a symbol of its first ruler, Alexander the Great. The four horns represent the four generals who took over parts of the empire when Alexander died. 3. Then a little horn sprouts up from out of one of the four. What power did this "little horn" represent? Acts 18:2. Claudius [Caesar] had commanded all Jews to depart from _______. NOTE: The "little horn" that persecuted God's people, trampled holy things, and stood up against Jesus represented Rome--both pagan and papal. Rome is the only power that followed Grecia and became exceedingly great. 4. Daniel was told that this little horn would defile the sanctuary. How long until it would be cleansed? Daniel 8:14. Unto ___ thousand and three hundred days; then shall the sanctuary be cleansed. 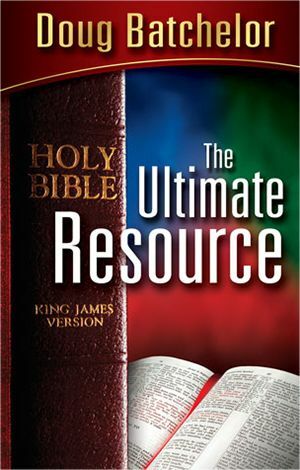 NOTE: This 2,300-day period is the longest time prophecy in the Bible, but the starting point is not given until the next chapter--in Daniel 9:25. 5. How did Daniel respond when he saw the little-horn power persecute God's people and obscure the truth? Daniel 8:27. And I Daniel fainted, and was _____ certain days; ... and I was astonished at the vision, but none understood it. NOTE: Daniel was so deeply grieved by what was to come upon God's people that he fainted and was sick for some time. But initially neither Daniel nor his friends understood the 2,300-day section of the vision. 6. In the next chapter, the angel explains the prophecy in greater detail. How long was the time period not previously described in the vision? Daniel 9:24. _______ weeks are determined upon thy people and upon thy holy city, ... to seal up the vision and prophecy. NOTE: Several years after Daniel's vision about the 2,300 days, an angel of heaven flew quickly to his side to help him understand it. The angel also expanded the vision to include 70 prophetic weeks that were "determined upon," or allotted to, the Jews and the city of Jerusalem. God was giving His chosen nation another chance--a 490-year opportunity to accomplish its purpose of presenting the Messiah to the world (Daniel 9:23, 24). 7. 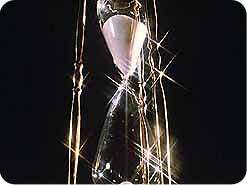 What was the starting point for the 2,300-day and 70-week time prophecies? Daniel 9:25. Know therefore and understand, that from the going forth of the commandment to ________ and to build Jerusalem unto the Messiah the Prince shall be seven weeks, and threescore and two weeks.. NOTE: The angel told Daniel to begin counting the 2,300-day and 70-week prophecies from the decree to restore and rebuild Jerusalem. God's people were in captivity in the Persian empire at this time. 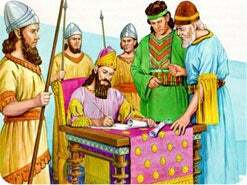 The decree was made in the seventh year of King Artaxerxes, who began to reign in 464 B.C. (Ezra 7:7). Artaxerxes' decree in 457 B.C. 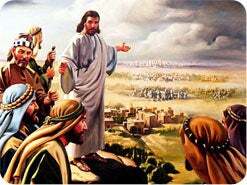 was the only one that specified restoring and rebuilding Jerusalem. 8. The angel said that if you count 69 weeks from 457 B.C., you will come to Messiah the Prince. Did this happen? Acts 10:37, 38. That word, I say, ye know ... after the baptism which John preached; How God _________ Jesus of Nazareth with the Holy Spirit and with power. NOTE: Yes, it did. Here is a fantastic miracle. Hundreds of years before Jesus was anointed with the Holy Ghost, the event was foretold in prophecy! "Messiah" is the Hebrew word for "anointed," and the word "Christ" is the Greek equivalent. Luke 3:21, 22 says this special anointing by the Holy Ghost took place at His baptism. Now here's the key. In Bible prophecy, one prophetic day equals one literal year (Numbers 14:34; Ezekiel 4:6; Luke 13:32). Adding 69 weeks, or 483 prophetic days (69 x 7 = 483), to 457 B.C. brings us to the year A.D. 27. Jesus began His ministry as the Messiah after His baptism in A.D. 27, exactly 483 years after the decree given in 457 BC. This is why Jesus began preaching, after His baptism, that "The time is fulfilled, and the kingdom of God is at hand." Mark 1:15. He was speaking of the time prophecy in Daniel 9:25. 9. What was to take place next in the prophecy? Daniel 9:26, 27. After threescore and two weeks shall Messiah be ____ ___, but not for himself ... And he shall confirm the covenant with many for one week: and in the midst of the week he shall cause the sacrifice and the oblation to cease. NOTE: The prophecy next predicted that Jesus would be "cut off," or crucified, in the middle of the last week of the 70-week prophecy. 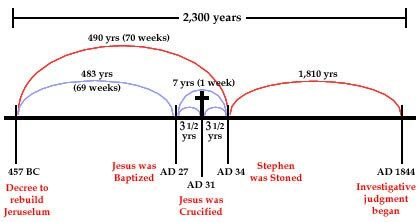 Counting three and one-half years from His anointing in the fall of A.D. 27 would take us to the spring of A.D. 31, which is precisely when Jesus was crucified. 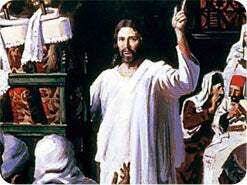 At the time He died, the temple veil was torn into two sections from top to bottom (Matthew 27:50, 51), indicating that Jesus had caused the sacrificial system to cease by His death as the Lamb of God. Please review the time line above. 10. Jesus told His disciples to preach first to which group of people? Matthew 10:5, 6. Go not into the way of the Gentiles, ... 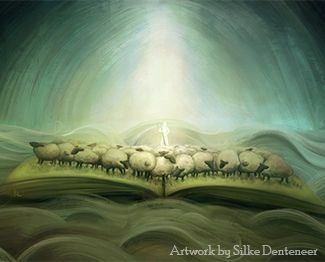 But go rather to the lost sheep of the house of ______. 11. What warning did Jesus give to His chosen people? Matthew 21:43. The kingdom of God shall be ______ from you, and given to a nation bringing forth the fruits thereof. NOTE: Jesus had made it very clear that the special status of the Jewish nation would be taken away if the people persisted in rejecting the Messiah. 12. So what is the other "nation" spoken of by Jesus in Matthew 21:43, which would become His chosen people? Galatians 3:29. And if ye be ______________, then are ye Abraham's seed, and heirs according to the promise. NOTE: As of A.D. 34 with the stoning of Stephen (Acts 7:58, 59), the literal Jewish nation was no longer God's only chosen nation. Because they consistently resisted God's plan for them, the nation of Israel is no longer the central focus of end-time prophecy. Now all who accept Jesus are His chosen people, and the promises God made to literal Israel now also apply to spiritual Israel (Romans 9:6-8). 13. 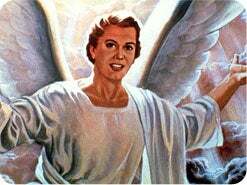 According to the angel who spoke with Daniel, what would happen at the end of the 2,300 years? Daniel 8:14. And he said unto me, Unto two thousand three hundred days; then shall the _________ be cleansed. NOTE: In A.D. 34, there remained 1,810 years of the 2,300-day prophecy. (Note dates in diagram above.) Adding 1,810 years to A.D. 34 brings us to the autumn of 1844. The angel said that at that time, the heavenly sanctuary would be cleansed. (The earthly sanctuary was destroyed in A.D. 70.) Jesus, our high priest in heaven (Hebrews 4:14-16; 8:1-5), began removing the records of sin from the heavenly sanctuary (Revelation 20:12; Acts 3:19-21) in 1844. This first phase of the judgment is called the pre-advent judgment because it takes place before Jesus' second coming. 14. 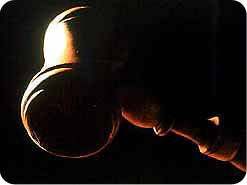 Whose cases are being considered in the pre-advent judgment? 1 Peter 4:17. Judgment must begin at the ______ of God. NOTE: This first phase of judgment considers only those who claim to be God's children. 15. What will be examined in this first phase of judgment? Revelation 20:12. The dead were judged out of those things which were ________ in the books. Ecclesiastes 12:14 For God shall bring every work into judgment, with every secret thing. James 2:12 They ... shall be judged by the law of liberty. 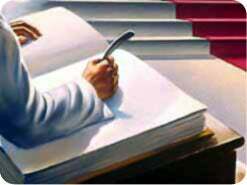 NOTE: The evidence in the judgment comes from books kept in heaven, which contain all the details of a person's life. (See also Psalms 56:8.) The Ten Commandments, God's law, is His standard in the judgment (Revelation 22:14). 16. 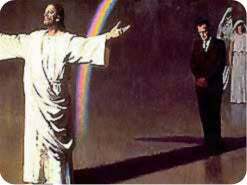 Is God my accuser in the judgment? Revelation 12:9, 10. That old serpent, called the ________ ... was cast out into the earth. ... 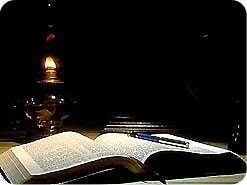 The accuser of our brethren is cast down, which accused them before our God day and night. NOTE: No! Satan is your only accuser. 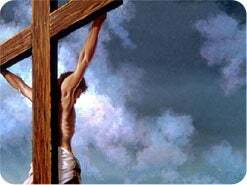 Unfortunately, some Christians think Jesus is trying to convince the Father to spare us during the judgment, but Jesus said, "The Father himself loveth you." John 16:27. 17. Must I stand alone in the pre-advent judgment? A. Jesus is our advocate (1 John 2:1). B. Jesus is our judge (John 5:22). C. Jesus is our faithful and true witness (Revelation 3:14). NOTE: Thankfully, no. In the judgment, Jesus is the Christian's attorney, judge, and witness. If you live for Jesus, you can't lose (Romans 8:1; Colossians 1:12-14)! 18. If Jesus is your attorney in the judgment, He promises to win your case. Will you turn your life over to Him today? 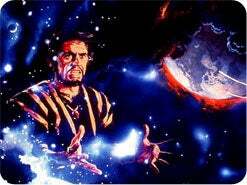 Some Bible students detach the last week (or seven literal years) of the 490-year prophecy given in Daniel and apply it to Antichrist's work at the end of time and a seven-year tribulation. There is no Bible support for this practice. A. 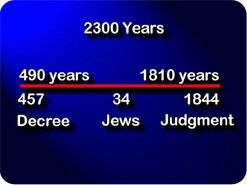 The 490-year prophecy is a continuous time period, as were the 70 years of exile for God's people mentioned in Daniel 9:2. B. The starting point for the last seven years of the prophecy was Jesus' baptism (A.D. 27). This is why He began to preach, "The time is fulfilled." Mark 1:15. 1. "Messiah" would be "cut off," or crucified (verse 26). 2. He would "cause the sacrifice and the oblation to cease" by dying for all as the true Lamb of God (verse 27 1 Corinthians 5:7 15:3). 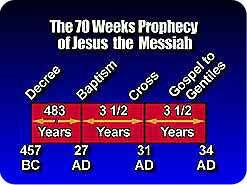 His coming as the foretold Messiah, right on time, proved all dates of the entire 490- and 2,300-year prophecy to be flawless and complete.